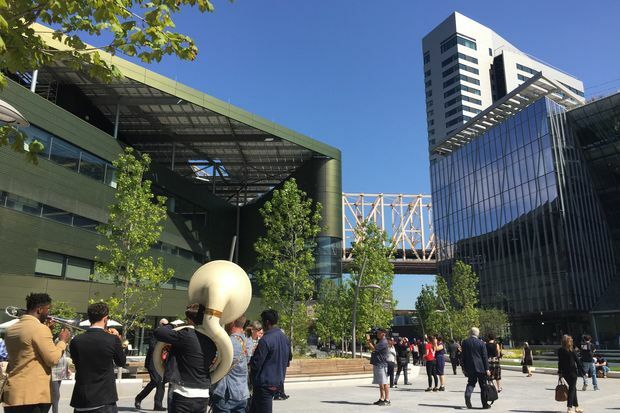 Cornell Tech opened its new campus on Roosevelt Island on Wednesday. ROOSEVELT ISLAND — Cornell Tech, touted as the first campus built for the digital age, officially opened its first phase Wednesday with some of the world's most energy-efficient buildings and aspirations to turbocharge the city's tech sector. “This helps bring New York City back to the future,” said former Mayor Michael Bloomberg, who spearheaded efforts to create the campus. Cornell Tech, a partnership between Ithaca’s Cornell University and Technion-Israel Institute of Technology, was tapped by the city in 2011 to build the $2 billion campus after a competitive bidding process. With more than 300 graduate students, the campus is located near the island’s southern end, sandwiched between the FDR Four Freedoms Memorial and the Roosevelt Island Tram. 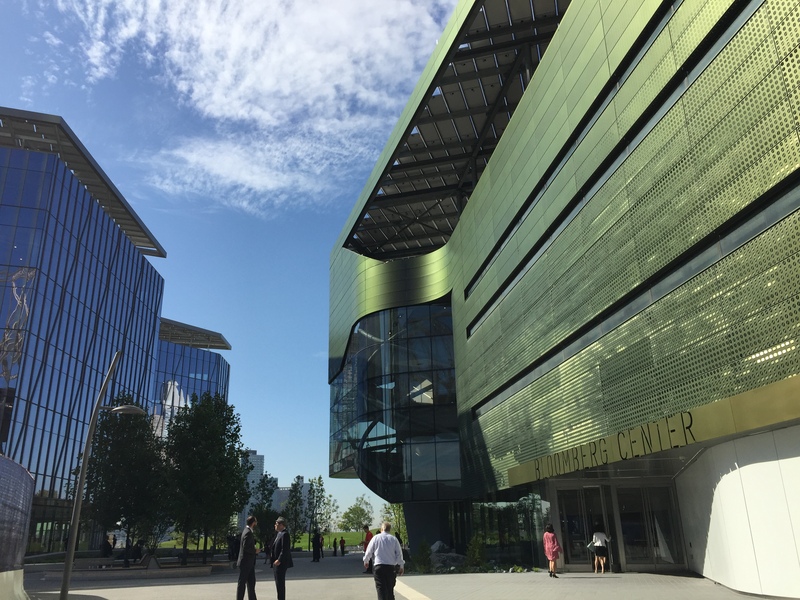 Its four-story, 160,000 square foot academic center aims to be one of the country’s largest net-zero building, with all of its power generated on campus. It’s a tall order for a building that’s open 24 hours a day. The building, called the Emma and Georgina Bloomberg Center (named after the former mayor's daughters), received a $100 million gift from Bloomberg Philanthropies. Among the art included in the building is a Works Projects Administration-era mural that had been in Goldwater Hospital, a publicly funded nursing home and rehabilitation center that previously occupied the site. The dorm, at roughly 270-feet tall, is the tallest high-rise in the world to meet rigorous passive house standards, reducing energy through making it air-tight and filtering in clean air. It already has inspired an even taller passive house building that’s now planned across the river in East Harlem — which is among the goals of the campus, Cornell President Martha Pollack said. The graduate school has no “academic silos,” she explained. Engineering students work with law students, business students and computer science students. Academia and industry are linked together, and companies are an integral part of the campus to ensure that collaborations have commercial applications. To foster connectivity and collaboration, the academic buildings have few walls and the professors have no private offices, noted Bloomberg, whose City Hall office known as the bullpen famously had no walls. “This may be the only university in the world where there are no private offices,” Bloomberg said. 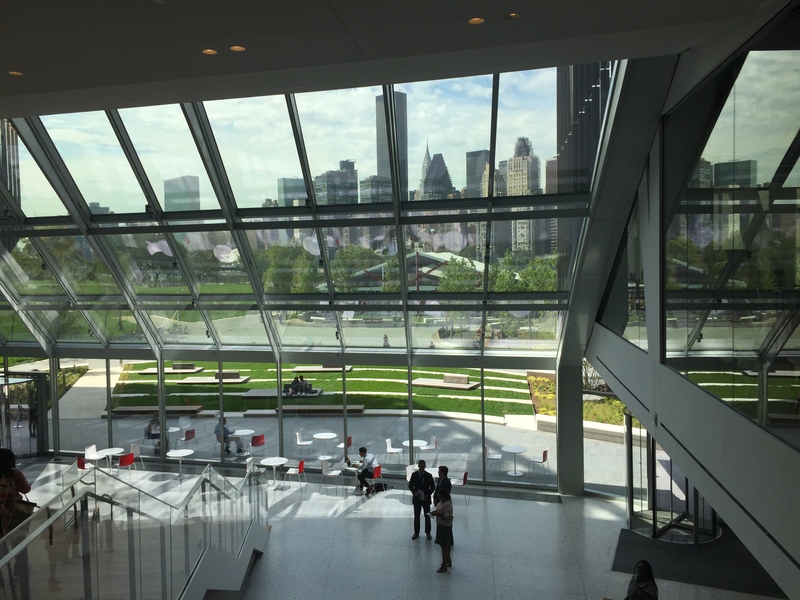 Noting that “the art of discovery involves collaboration," the former mayor pointed out that the school is based on collaborations between the private and public sector, between university and business and artists and architects. Mayor Bill de Blasio commended Bloomberg for his vision in getting the campus built. He noted that salaries of tech sector jobs grew three times faster than other private sector jobs since 2010. “These jobs in the tech ecosystem are the kinds of jobs a family can live on,” de Blasio said. Already, Cornell Tech, whose students have been attending class at Google’s Chelsea offices, have spun off 38 startups, roughly 95 percent of which remain in New York, according to Cornell Tech Dean Daniel Huttenlocher. Building the campus in such a short time frame has not been easy, he added. “It’s a bit like surfing a big wave: totally exhilarating but a bit challenging to keep up with,” he said. 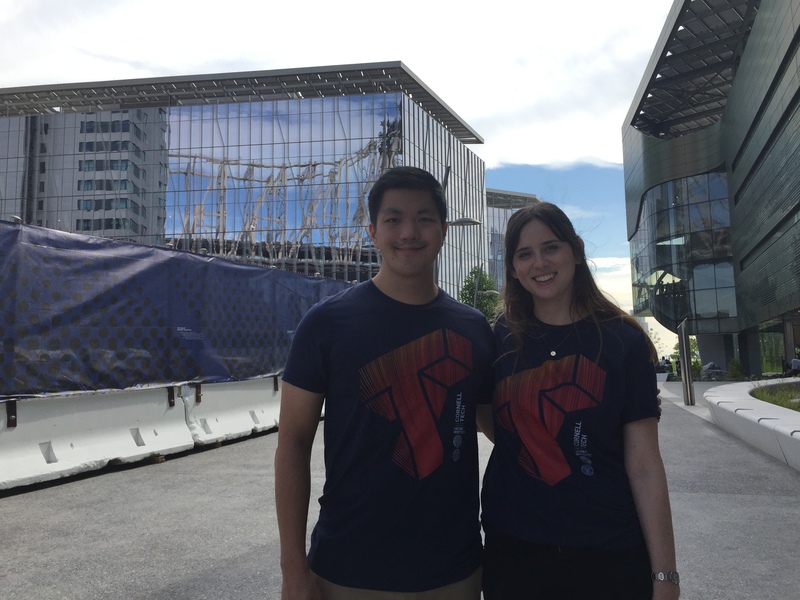 David Cheng, 29, who graduated from Cornell Tech last year, and Eliza Bruce, 26, a Parsons School of Design graduate, who participated in the program’s studio collaborative class last year, received $100,000 in pre-seed funding from Cornell Tech for their startup Speech Up, a program aiming to make speech therapy for kids into a fun game — and one that’s affordable — along with workspace for a year in the building known as “the Bridge” on the campus where companies work alongside academic teams. “Being working professionals here, I don’t think there’s any other place where you have access to industry experts and research gurus and geniuses,” said Cheng. Plus, when they’re trying to find new recruits and interns, they have Phds and Masters students at their fingertips, he added. Already, Cheng, who currently lives in Midtown is eyeing a move to Roosevelt Island. Cornell Tech is also working with New York City public schools, working with more than a dozen K-12 schools to help train teachers to incorporate tech thinking into its teaching, including Roosevelt Island's P.S. 217. It has also partnered with CUNY on a partnership called Women in Technology and Entrepreneurship to get more women in technology.